Returning rider: NC750X dct or Africa Twin dct? Discussion in 'Land of the Rising Sun: ADV Bikes from Japan' started by BrianInPA, Feb 25, 2019. I’ve been reading here for years now and finally joined up to ask your advice. About 3 years ago, at age 50, I had 5 strokes which left my left arm and leg paralyzed and my balance completely shot. Fortunately after they put some heart stents in my brain, I’ve had a miraculous recovery. I still have some residual weakness in the left lower leg and foot, which makes shifting difficult but not impossible. Last fall I picked up the DR350se, mostly to make sure I could still ride and balance a bike. I can ride it fine, but after a while I get tired of shifting with my left foot. So I’m selling the DR350 and plan on buying either a NC750X with dct, or an African Twin with dct. Given I’ve been away from bikes a number of years now, I thought I’d get back into riding gently with the NC750X. However, I can buy a used Africa Twin dct for about the same money I’m going to spend on a new NC750X. My all time favorite bike was the ST1100, for comfort and touring ability. Question: given the bikes I’ve come from, and my size - 6’1”, 250 lbs , 30” inseam - would I be better off getting the bigger Africa Twin? I’m 53 and no longer too impressed by speed, but I do want a bike I can take on fire roads and state game and forest roads that will hold its own doing so. Nothing too challenging. I also hope to plan some longer regional rides once I get more fully back in practice. Any thoughts or wisdom for a guy getting back in the saddle after some time and serious disability? Nc750 is a very light user friendly bike, I had 1 for a month as a courtesy bike..
Toto, EZMoney, knight and 3 others like this. Good advice. I’ve read a lot praising the NC750X in general, but it’s off-road ability doesn’t sound as good as it could be. I.e., it’s more of a street bike. Then again, I’m never going to do more off road riding than gravel and dirt roads. Nothing much more advanced than that. So it would probably be fine for my purposes with some decent dual purpose tires. jamesmc and knight like this. I'd buy a nc tomorrow if I was a commuter.. It's so light and friendly..
knight and BrianInPA like this. The NC may have its weight low down, but i dont consider 230 kilos lightweight.... Especially as the @ DCT is only 12 kilos heavier. Personally i would go @, i've rode the NC and didn't like it at all. You need to test ride both. Jdhuff and BrianInPA like this. After a wreck in '14, and with limited use of my left leg now, I'm on another R1200GS. Yes, shifting is a PITA, and physically painful, a little. Your inseam is the only thing that concerns me about the Africa Twin. For me, planting my left foot can be a little uncertain and painful, and I have 3 inches more inseam. The bigger bike will definitely be more comfortable. If You feel like the reach isn't an issue, that would be the obvious choice to me. If you're interested at all on riding dirt roads, get the Africa Twin. It will also be a good fit for your size. The_Precious_Juice, neanderthal and BrianInPA like this. I agree that riding both is the ticket. At least sit on both to see if you are comfortable. I have an NC700X and love it. It feels super light with the weight down low. The engine is super smooth and well behaved. Great mpg. I ride regular gravel roads just fine. I wanted a super easy bike to ride. I thought about an AT but it was too tall for me as a commuter and it doesn’t have the built-in storage. Also, I got a good deal on a new leftover NC that sealed the deal. The AT would run circles around the NC on anything off road. If you want the rush of hitting the throttle and accelerating at light speed, the NC is not for you, it is half the horsepower of the AT. anjin75, knight and BrianInPA like this. Africa twin will be too heavy and too big IMO for you in such situation, plus you don't want to mess with tubes do you? 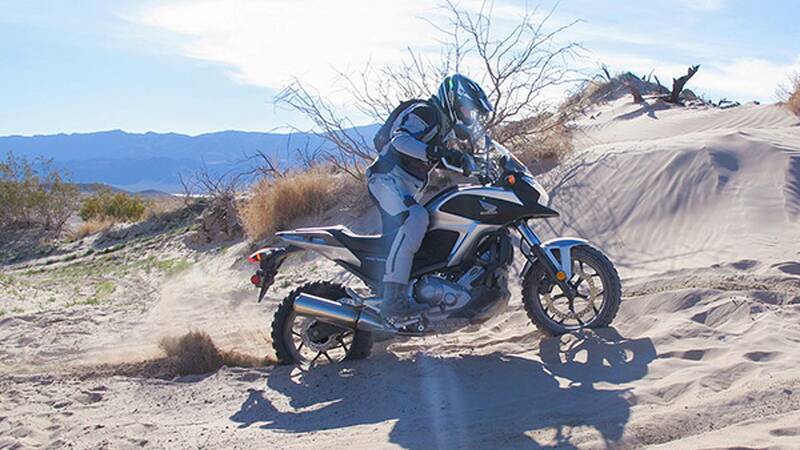 Get nc750x, very good bike, even off-road (I tried that) easy handling and handy frunk. The_Precious_Juice, knight and BrianInPA like this. Fortunately my balance came back, more quickly than my muscles. Thanks everyone for the great input. I need to stick with my first impression, which was the NCX, at least for now. You're going to be disappointed with the ground clearance , even with the Rally version, but it does look like fun! If I had money to blow, I’d buy one to play with. But for now I only have the $$$ for one bike, and it needs to be an actual bike, not a trike. I rode a friends nc. It was so weak I thought something was wrong with it. Go for the nc750. I owned the 700 version (and have ridden the AT) and it will do what you seek and is significantly easier to manage. The_Precious_Juice, Cuttin, BronNowo and 1 other person like this. Just get the Africa Twin. It'll save you the trouble of having to sell the 700 later when you get bored of it and want the AT. I'm 5'7 and had no problems riding my AT with the seat in the high position. The power was enough to have fun but certainly not overkill. this bike motor has excellent torque and very low CoG. The_Precious_Juice, EZMoney, knight and 1 other person like this. Just get the Africa Twin. It'll save you the trouble of having to sell the 700 later when you get bored of it and want the AT. At 53 I’m honestly no longer interested in a fast bike. I just want one that will be reliable and simple to ride and handle. Economical doesn’t hurt either. It sounds like the NCX will more than adequately fulfill my needs right now. EZMoney and knight like this. You really wont know whether it will suit you until you ride one. I really liked the idea of the NC, right up until the point i rode one. Its a Marmite bike that some love and some hate, with myself being the latter. The storage under the fake tank is brill though, as i usually always have to have a tail pack for various stuff that i always want with me. JustKip and knight like this.